Comedy as a Weapon presents Comedy at the Academy starring Mike Yard and other special guest live at the Academy of Music on September 9th at 8:00pm to help raise funds for the Northampton Recovery Center. Comedy as a Weapon is a comedy organization dedicated to the philosophy of helping and healing people through the power of laughter. They have been dedicated to this goal since 2014, and they feel, now is a critical time to expand our outreach to addiction. 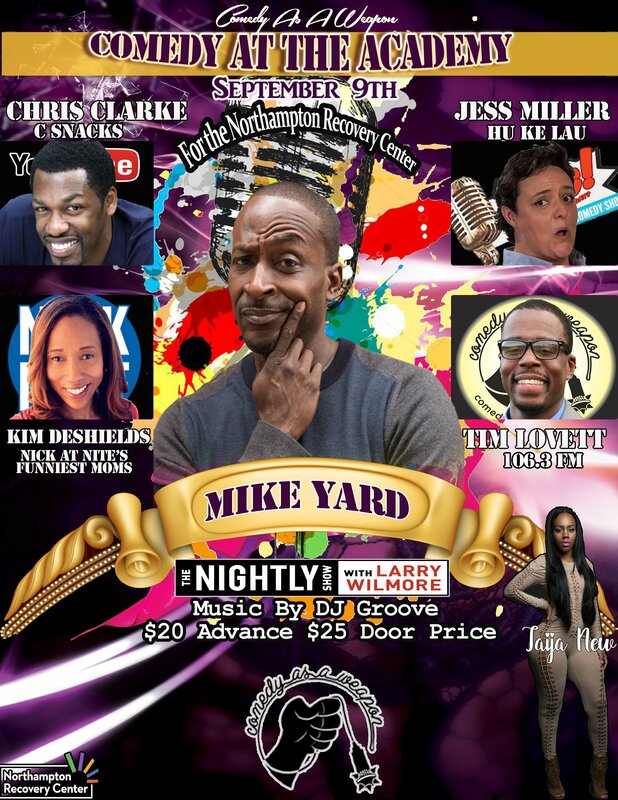 Mike Yard is a stand-up comedian and a contributor to Comedy Central’s The Nightly Show with Larry Wilmore. He is also the host of podcast “Yard Talk with Mike Yard.” He lives in Brooklyn, New York. Other works include Souled out Comedy (2009) and Holla If I Kill You (2003). Other comics include Jess Miller, Kim “Boney” DeShields, Chris “C-Snacks” Clarke, with special performances by Taija New, and hosted by Tim Lovett and Dj Groove.